With TS2000-DP, MPI is offering a versatile and cost-effective probe station for on-wafer high power device measurement in temperature range from 20°C to 300°C, and measurement capability up to 3 kV (triaxial) / 10 kV (coaxial) and 600 A (pulsed). TS2000-DP provides access up to 12x High Voltage (up to 3 kV triaxial or 10 kV coaxial) or 4x multi-fingers High Current up to 400 A MicroPositioners. 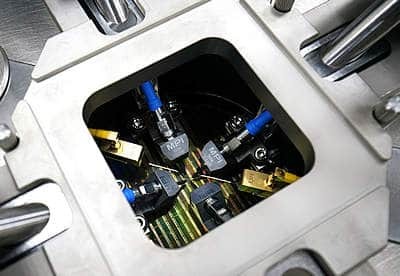 Many single probes, dedicated probe card holder for anti-arcing high power probe cards are making the system an ideal choice for High Power device characterization measurements. The system is equipped with ArcShield™ to prevent any possible arcing between the chuck and the probe platen. The anti-arcing probe card has a capability to apply high-pressure around the DUT and by using the Paschen law to prevent arcing between the pads. Specially designed anti-arcing LiquidTray™ can be used for arcing suppressing by simply placing it on the high power chuck surface. Wafers can be safely placed inside the tray to submerge in the liquid for arcing free high voltage test. The MPI chucks are designed for up to 10 kV (coaxial) at 300°C. TS2000-DP can be configured with variety of instrument connection packages, which consists of necessary high voltage / high current probes and cabling accessories for optimal connection to the test instruments such as Keysight B15005 (3 kV or 10 kV) including integration of the Module Selector or Keithley 2600-PCT-XB, including integration of 8020 High Power Interface Panel.